Rated R for adult themes. Was there reference to the R-rating in the intro? I missed it, making this not good for mixed company or the family. In fact, the opening scenes feel like they boarder on NC-17-rating. Getting (finally) passed that, it's very interesting! What I loved most about this story was the fatherly bond that developed between the nixie and Sylvain, culminating in the rescue from the fountain. The image of Sylvain cradling and rocking the nixie back to calm resonated with me as a father. The idea of providing running water through velvet sleeves and magic is genius, and made me realise that the first plumbers must really have been making things up as they went along. Finally, I loved the image of collapsing all the palatial plumbing both to spite the courtiers and to care for the nixie. It is, for some reason, tremendously satisfying to think of rich layabouts having everything taken from them when they do not appreciate it. PS - I'm not clear on what killed Leblanc. PPS - Though I suppose the detail didn't matter to the story. Tomato is a fruit, watermelon is a berry, banana is a herb and everything you know is wrong. A story I needed to listen to twice to understand it. I'm glad I gave it a second try. Still not sure who or what killed LeBlanc, though I would guess it was the nixie. Great settings, characters, and presentations. Was the nixie sounding like Serkis' Gollum intentional? it worked for me, because it made her alienness clear. My impression was that LeBlanc died of his alcoholism. I felt like there were some incongruities with Sylvain's character. He was such a manipulative and selfish jerk in the beginning and I didn't really see what happened over the course of the story to change him to how he was in the end. He was also extremely driven and proud, but seemed to have no sense of what his true goals or values were. 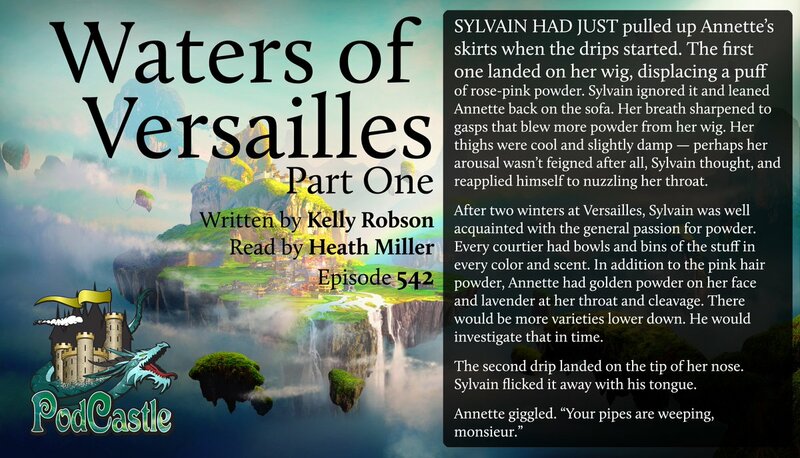 Yeah, I think that is what the author was going for, but it didn't really work for me because Sylvain was the one who put her down there in the fountain in the first place. He captured her as a baby and forced her to work to gain his notoriety and favor from all of the terrible people in court. It makes me mad, like the videos of people "rescuing" animals from their fishing nets. It is good that Sylvain took her out of the fountain and had some change of heart, but that is the least he could do to maintain not-evil status. You don't become a hero when you are saving victims from something you purposefully did in the first place.